Look at the excitement on the kids’ face! 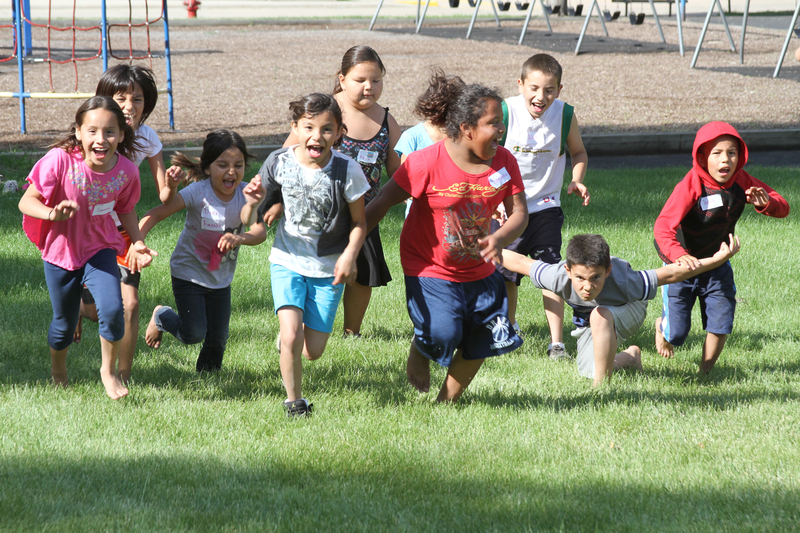 This week marked the start of day camp with children from the Lower Brule Sioux Indian Reservation. Monday – The day began with meeting kids and parents at our pick-up spot, St. Mary’s Church in Lower Brule. Fifty students attended camp today. After breakfast, we visited about camp expectations with all our campers. Everyone was very well-behaved and ready for a great day! With two weeks of camp already under their belts, camp staff was ready for anything. Tuesday was a beautiful sunny day with 58 children attending camp, 27 of which were new. Janeen had Arts & Crafts going strong today, and Mark had a great game of kickball underway. All in all, camp is going well. Wednesday turned sunny day after a nice rainfall in the very early morning. We had 60 children in today’s camp for the water safety course presented by South Dakota Game, Fish & Parks and the Army Corps of Engineers, complete with the small boats for the kids to ride around in. Back on campus, we had Arts & Crafts and brick coloring. The afternoon brought swimming and snacks. It was another exciting week at the Rising Eagle Summer Day Camp!!! What a joy to see the kids having so much fun. God bless them.